Chapel Lane, from its junction with Moorbridge Road to Fosse Way (Old A46), will be closed: 07.00 hours Saturday 12th January 2019 until 22.00 hours Sunday 13th January 2019 07.00 hours Saturday 19th January 2019 until 22.00 hours Sunday 20th January 2019 Please see the attached document for further information. There will be a 2 way Stop and Go Boards in place on Chapel Lane around the junction with Kirk Hill from the 14th of January until the 28th of February to allow for Footway Improvement Works. Please see the attached document for further details. We are pleased to announce the winners of the Bingham Festive Window Competition 2018! Many thanks to all the entrants for making Bingham so fabulously festive! 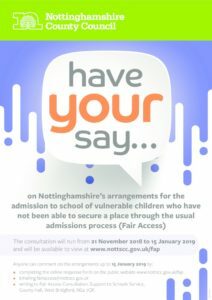 Nottinghamshire County Council is carrying out public consultation regarding a draft revised fair access protocol. The protocol has been updated to reflect the publication of more recent legislation to which it refers and changes in the way of working for school locality panels across the primary and secondary phases. writing to Fair Access Consultation, Support to Schools Service, County Hall, West Bridgford. NG2 7QP. Please see the attached document for information on road closures on the 30th of November for the Bingham Christmas Fair. The Town Council’s Extra-Ordinary and Planning meetings on the 27th of November will take place at the W.I. Hut. Bingham Town Council has apologised unreservedly to the families for any distress caused by soil removal preparations for a burial taking place later this week. Following an urgent investigation and action taken to move the soil to an alternative area, a further review of standard procedures will be considered by Council. The Tithby Road steps will be repaired this week, following the damage they sustained by a fallen tree during Storm Ali. A further update will be posted when they can be used once again to access and leave the Linear Park. Temporary two way traffic signals will be in use on Fosse Way (the old A46) from Monday the 26th through to Friday the 30th of November. Please see the attached document for more information. Chapel Lane will be closed for three weekends due to the ongoing construction works: 07:00 Saturday 17th until 22:00 Sunday the 18th of November 07:00 Saturday 24th until 22:00 Sunday the 25th of November 07:00 Saturday 1st until 22:00 Sunday the 2nd of December Please see the attached document for further information and diversion route.